Another great example of how an area can be transformed when the city council works closely with local residents at every stage of a regeneration project, led by ‘what people have asked for and would like’ rather than what they think the area needs. This article, by Thomas Barrett, was originally published on NewStart, a website for making places better. Subscribe for just £49 per year here. 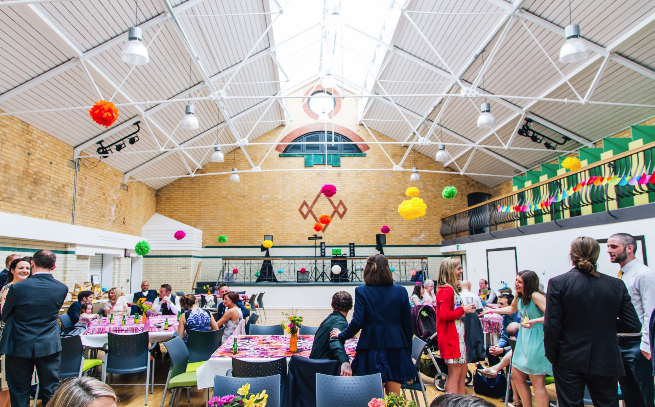 When asking around for examples of outstanding community hubs in Birmingham, one place was recommended to me more than any other – Stirchley Baths. Built as Bourneville Lane Swimming Baths in 1910 on land donated by the Cadbury brothers, the building was regularly used by workers at the chocolate factory which stands less than a mile away. Generations learnt to swim there as the community grew from a small village to a lively suburb of Birmingham until cuts let to its permanent closure in 1988. By 2012, the only water inside the pool was from puddles of rain that leaked in through a roof that had long been stripped of its tiles by thieves. Standing on a major artery into the city centre the listed building had become an eyesore, and it was looking like a matter of time before it would be demolished. ‘I’m a believer in managed serendipity,’ says Karen Cheney, who was the restoration project lead for the council and now has a permanent office in the building. Private developers had taken a look the building throughout the 90s and 00s, but with council budgets slashed, it was looking like only a miracle would save it from being condemned. However, across the road from the baths was an old community centre which was compulsorily purchased by Tesco. ‘So there was suddenly a capital receipt that had to be paid to return a community facility,’ says Karen. It freed up £3m for the cash-strapped council to invest into the restoration of the baths, which was topped up with a £1.2m grant from the Heritage Lottery Fund. Stirchley was once seen as an unpretentious place to get a foothold on the housing ladder, before moving on to elsewhere in the city. It’s now seen as a desirable place to live in its own right, with Stirchley Baths now well placed to cater for its community of families, young professionals and those who have lived here all their lives. So when they were planning the restoration, it was crucial that the views of the diverse community were taken into account. ‘People felt like it was their project and not just a city council project that builds something and just expects people to use it,’ says Karen. Residents were involved in almost every aspect of the plan, from deciding what its name would be to working with contractors on site. It was quickly decided that it had to have a 21st-century purpose and offer more than just a swimming pool. It couldn’t simply be a museum to what came before. There’s no city council logo on the building, either, which Karen says changes the mindset when you walk in. ‘We tried to make it look as un-municipal as possible,’ she adds. After opening in early 2017, the building now boasts a range of classes, from Arabic to Zumba with just about everything in between. It’s also rented out for private functions, including weddings and business conferences. During my tour of the building, I interrupt a women’s group deep in conversation about Christmas shopping, and another group are practising Thai Chi in the room where the former swimming baths once were. The café in the building was set up as a community interest company, and it employs people who have traditionally found it difficult to get into mainstream employment, as well as sourcing local and organic food. ‘We don’t come up and say we think this area needs this or that,’ says Karen. According to Karen, it’s not austerity that has forced the council’s hand into involving the community more, either. ‘It’s because it’s the right thing to do,’ she says. Any building that’s over a century old will have kernels of history built into its fabric. Volunteer Ron, who conducts my tour, points to a picture on the wall of the baths covered with wood panels during wartime when dances were held to keep up local morale. Ron believes the baths were only closed once during World War 2. Cadbury’s was used as a munitions factory, and the canal network was vital to transport the arsenal out before being shipped abroad. The canals were targeted by German bombs, which flooded Stirchley High Street and put the baths under five feet of water. Ron himself first came to the baths with his father aged 5 and vividly remembers the mass protests against its closure in 1988. With memories of wartime now fading, they opened a monthly Memory Cafe for residents with dementia, Alzheimer’s and with memory problems to talk about the past in a relaxed and welcoming environment. They hope to trigger memories by using props, music, dance, film and the Baths building itself. ‘We’d not been aware of the esteem and pleasure that people had of swimming here,’ says Karen. Karen says income generated has exceeded what they originally put in their business plan, but the building is still not financially sustainable in its own right. She believes it’s ripe for a community asset transfer, so it’s run more and more by local people. It would be the next stage of the baths’ storied history which is now well placed to nurture the community in Stirchley for the next 100 years. Read more about Stirchley Baths here.